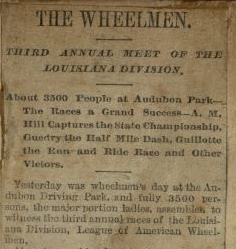 In September of 1887, New Orleans cyclists held the 3rd annual meet of the League of American Wheelmen (LAW), Louisiana Division, at the Audubon Park Race Track. Originally a horse racing track, it was used for the new sport of bicycle racing. The races held there in March 1887 were the first ones held on a track in New Orleans. Although attendance at that race had been disappointing, interest in cycling--as sport, hobby, and transportation--rose steeply that summer. 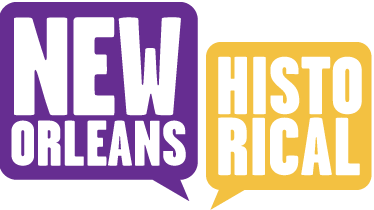 The cycling scene in New Orleans began in 1881 with the forming of the New Orleans Bicycle Club (NOBC). In the summer of 1887, a new club, the Louisiana Cycling Club (LCC), was formed by a few members who had split off from the NOBC. 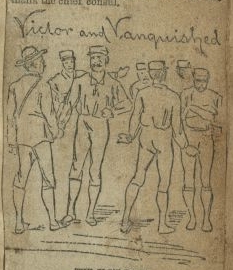 The LAW meet at Audubon Park that September was the first contest between the rival clubs. The event was one of the biggest of the year, with 3500 people filling the stands. The streetcar to Audubon Park ran on a special schedule leaving downtown every three minutes all day. Two-thirds of those in attendance were women. The freedom to attend amusements outside of the home was new for the bourgeois women of late-Victorian society, and they were crazy for spectator sports. The women came to the race track wearing airy summer dresses and ribbons in the colors of their favorite club--blue and white for the NOBC or purple and gold for the new LCC. Down on the track, the unaccompanied men pressed against the fence and the riders themselves entreated each other repeatedly to turn around and "look that stand," which looked like a hillside covered in wildflowers. 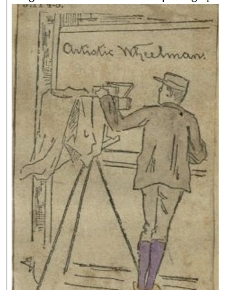 The ladies were reported to be not only clapping and waving their fans and handkerchiefs with abandon, but also betting their gloves and other articles on their favorites. The two champion riders of the NOBC, C.B. Guillotte and A.M. Hill, rode for the state championship. Hill, the cycling pioneer of New Orleans and founder of the NOBC, prevailed. The LCC was routed soundly by their elders in 1887, but over the next few years the young club would mount a serious challenge to the old veterans of the NOBC, producing a new generation of young cycling stars. League meets, Southern District meets, and other big cycling races would be held at the Audubon Park race track into the 1890s. 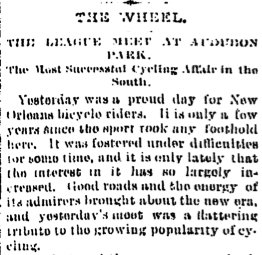 Lacar Musgrove, “Audubon Park Race Track, Cyclists hold League meet in 1887 ,” New Orleans Historical, accessed April 24, 2019, https://neworleanshistorical.org/items/show/543.